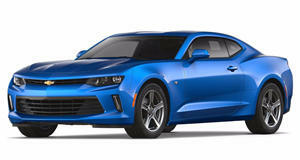 The Chevrolet Camaro is available in coupe or convertible styles and anything from a capable 275 hp turbocharged inline-4 to a stonking 650 hp supercharged V8. Rear-wheel drive is standard as is a 6-speed manual transmission with either an 8-speed or 10-speed automatic available depending on trim level. Performance and handling is excellent while interior space is very tight. Track performance packages and comprehensive technology and safety equipment make for a very capable sports car. Aside from a short hiatus in production during the 2000s, the Chevrolet Camaro has offered American shoppers a range of desirable sports cars dating all the way back to 1966. Now in its 6th generation the Camaro enters 2018 with a few minor trim and specification changes. The Camaro’s interior is a big step up from previous generations, there are still weak points such as the minor controls and switchgear which could be placed in more logical positions and a few below-par trim items though. The front seats are generously proportioned and provide a high degree of comfort for longer trips. The rear row is best left for smaller children who aren’t prone to bouts of claustrophobia or more realistically, as additional storage space for shopping bags. Coupes do have foldable rear seats which helps increase the very limited trunk space. If you are considering a Camaro as your next car, then the amount of cargo you can stuff in the trunk is quite possibly less important than the way the car handles. The good news is that when it comes to cornering, braking and tackling a twisty mountain road the Camaro is totally in its element. The standard suspension absorbs bumps and uneven pavement far better than you would expect considering its performance potential, the available adaptive suspension further improves the ride quality and the quiet cabin and muted engine note when not pressing on make for a relaxing cruiser too. The Chevrolet Camaro starts things off with a fuel-efficient and very capable turbocharged 2.0-liter 275 horsepower, 295 lb-ft of torque base engine. This can be upgraded to a 3.6-liter V6 which produces 335 hp and 284 lb-ft. The two top engine options are a pair of 6.2-liter V8s, one naturally aspirated unit with 445 hp and 455 lb-ft and a supercharged engine which makes 650 hp and 650 lb-ft. Power is sent to the rear wheels in all cases and a 6-speed manual transmission is standard with an 8-speed automatic transmission optional on all engines excepting the top 6.2-liter supercharged unit which can be had with a 10-speed auto. Performance is strong across the range with 0-60 mph times ranging from 5.4-seconds to 3.4-seconds. This matches up well to anything in the Camaro’s class. 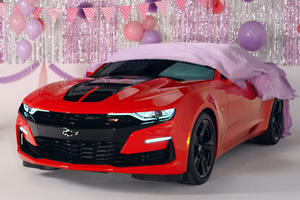 The Chevrolet Camaro can be had in either a coupe or convertible body style and in 6 trim levels. The LS and LT trim level comes standard with the 2.0-liter turbocharged engine with the 3.6-liter V6 an available option. 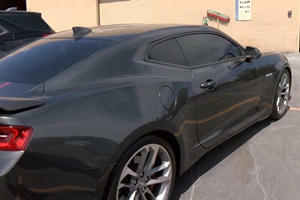 While the SS trim has the 450 hp V8 and the ZL1 comes equipped with the 650 hp supercharged engine. 1LS base trim models feature 18-inch wheels, cruise control, rearview camera, power front seats, 7-inch touchscreen with Bluetooth connectivity and Apple CarPlay and Android Auto.Chevrolet’s Teen Driver system is also standard. 1LT adds the 8-speed automatic transmission and remote starting. An 8-inch touchscreen and upgraded audio system is available as an upgrade pack for both 1LS and 1LT. 2LT trim adds dual-zone climate control, heated and ventilated power front seats covered in leather, 8-inch touchscreen and upgraded audio system and electrochromic mirror. The 6-speed manual transmission is standard. 1SS trim includes most of the 2LT trim items and adds 20-inch wheels, uprated brakes, limited-slip differential and sport suspension and most importantly, the 450 hp V8. Either manual or automatic transmissions can be specified. 2SS trim adds minor design accents and the inclusion of some 1SS optional packages which include a head-up display, side blind zone and rear cross traffic alert, interior lighting upgrades and heated steering wheel. 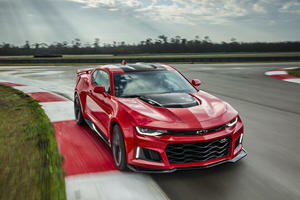 The top ZL1 trim includes all of the above and adds the 650 hp supercharged V8, bespoke cosmetic items and the option of a 10-speed automatic transmission. Track performance packages and performance handling packages are also available depending on trim level. The 2018 Chevrolet Camaro offers a broad range of engine choices and trim levels, base specifications are generous and good value while top V8 models are serious performance machines. Interior space is very limited in the rear but the key sports car ingredients of strong performance and sharp handling are in abundant supply. Chevy wants to move some old stock off the lot.